Just months after preventing The Everafter from shrinking, Rachel Morgan must find out how local magic has become deadly overnight, causing even the mildest spells to go horribly awry, frequently causing explosions that leave craters in their wake. The damage to witch and bystander alike is causing the working truce between humans and Inderlanders to unravel, and riots between species to be a daily event. Why is this phenomenon focused only around The Hollows? Is the elf Trent Kalamack really behind it? Is Kisten really alive, and bent on revenge? Or are darker forces behind the chaos? And what has happened to the Master vampires who normally keep their undead in check? The solution is slumbering away in The Everafter, where Rachel must gain the trust of an ancient Goddess in order to return wild elven magic to its source and restore the balance of power between the living, the dying, and the undead. 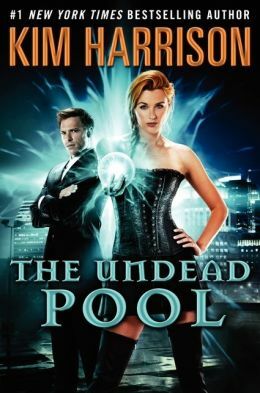 The Undead Pool, the twelfth in the Rachel Morgan series, is not a book to start reading if you have to be anywhere or do anything until it’s finished. This story of murder, racism, sexual tension, growth, and a power struggle that nearly wipes out two cities grabs you by the throat and doesn’t let go! Kim Harrison spins a wonderful web of intrigue that twists and turns and keeps you on your toes. This series is definitely a must-read!